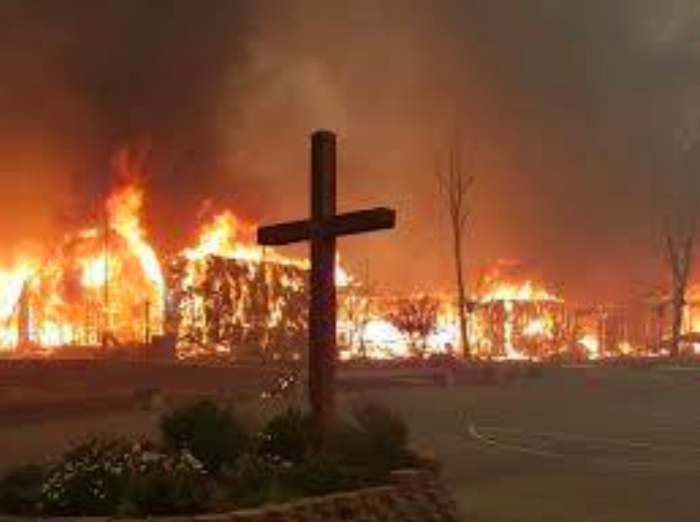 A large wooden cross that was left untouched by the California wildfires is serving as a reminder of God’s faithfulness to a town almost entirely destroyed by the inferno. On Facebook, Our Savior Lutheran Church Pastor Brandon Merrick posted a photo of the cross two days after flames devastated the town of Paradise along with the 54-year-old church building and the parsonage where his wife and two children lived. “This picture is not just a heartbreaking reminder of what can happen to the things and people of this world, this is our one true hope in the midst of tragedy that cannot be destroyed by anything,” he captioned the photo. The cross photo, taken by Tyler Frank and Elizabeth Osborn as they escaped the flames, went viral on social media, with many sharing how the image reminded them of God’s faithfulness amid tragedy. On Nov. 8, California’s massive Camp Fire, named after Camp Creek Road where the blaze began, tore through Paradise, destroying 95 percent of the town. In the town of 27,000, the inferno killed dozens of people and destroyed almost 19,000 buildings, businesses and homes. The town’s smaller neighbors, Concow and Magalia, were also all but destroyed, CBS reports. The blaze is the deadliest and most destructive wildfire in California's history. Overall, it has killed at least 85 people, left 993 missing, and burned through 10,360 residences and 150,000 acres. Firefighters finally contained the Camp Fire on Nov. 25, the California Department of Forestry and Fire Protection said. Pastor Merrick told Fox News he views the cross photo as a “great chance for the gospel to get out," as it demonstrates that God is stronger than even the most devastating of circumstances. Our Savior Lutheran Church reportedly plans to rebuild and has set up a site with their sister church where people can help support them.